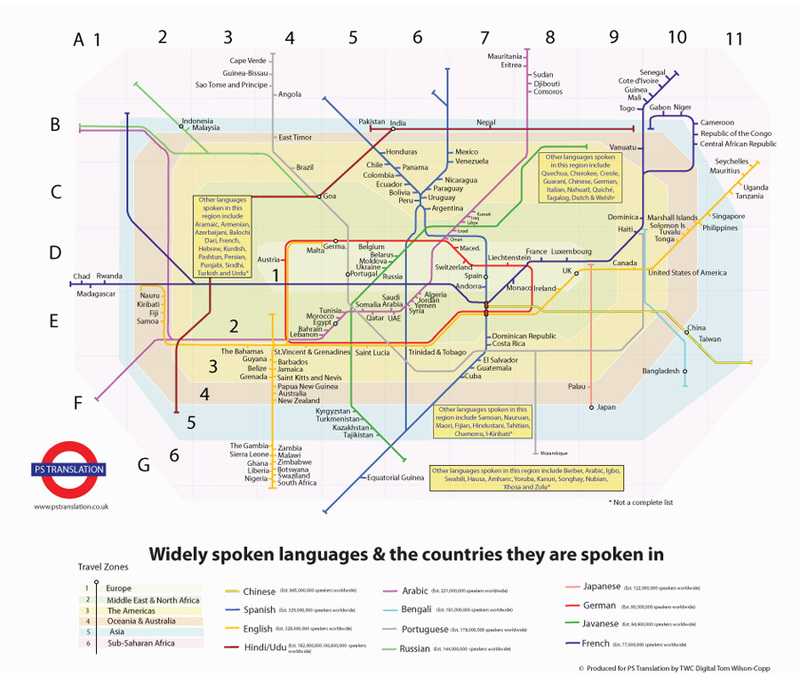 During my research into the type of courses I want to take I came across this London Tube Language map and was so impressed/amused by it that I just had to share it (you can click to enlarge it). What this map does is map out the most common languages in the world- but it also MAPS out where they are spoken which is pretty awesome. By looking at the different tube zones (helpfully subdivided into regions of the world) I can look at which tube lines (which correspond to spoken languages) go there, and thus decide on what I’d like to study in terms of where I see myself living and travelling over the next couple of years. There may be no need to see a visual interpretation of world language placement but there’s something really engaging about this, and it makes consuming information so much easier when you have a point of reference. One thing I picked up on was that the use of German worldwide was far more limited than my high school teachers would have me believe- they talked about it as the ‘business language of the world’ but the tube map shows it mainly in Europe and the Middle East. Now I have a better idea of what languages are spoken, I wanted to work out how difficult my choice of Mandarin would be. Happily, another infographic appeared, but sadly it revealed that my choice of language fell into the hard category, suggesting I’d need 88 weeks of training to become anywhere near proficient- 2200 class hours in Mandarin OR Japanese (typical). A little wary by this chart, but not undeterred I then proceeded to get added confirmation that learning Mandarin would be very VERY hard. Wikibooks has a section of their site where they rate language learning difficulty for English speakers and they have a chart that the USA Foreign Service Institute compiled. Sigh. I’m now fully aware that learning Mandarin will be a full on commitment and there’s no way I’ll be fluent by summer if I start now (though that was unlikely). I’m nervous, but strangely not discouraged- this is one challenge I’m going to face head on. Ni Hao to you readers- and we will see how much more I can say next year!